It was a deja-vu, at COTA, for Marc Marquez and Dani Pedrosa of the factory Honda team as they finished first and second respectively, just like last year. What followed behind them was far from expected. It was a mixed bag of surprising disappointments and almost equally surprising good results as the Factory Ducati's Andrea Dovizioso finished the podium in third. The Ducati rider finished 20 seconds behind the winner. Dovizioso's team mate Cal Crutchlow had a disappointing weekend as he crashed out of the race after having the rear tyre changed during the race. The strangest incident of the race could very well be the jump start made by Jorge Lorenzo. This was a very important race for him after the disastrous first round where he crashed in the first lap and couldn't score any point. The qualifying wasn't the best. Having secured fifth position on the starting grid, Lorenzo made a big mistake. The tear-off on his helmet visor had a bit too many insects, so he removed it for better visibility moments before the race start while the official holding the red flag walked away from the track. When Lorenzo looked back up, he saw the official was already gone and in some confusion took off when the red lights came on. He said he was distracted and wasn't thinking much. In the moment of confusion, he didn't wait for the red lights to go off. As a result, Lorenzo was penalized with ride through penalty from the pits. He rejoined the race in the last position and managed to finish in tenth position earning his first 6 points of the season. Valentino Rossi didn't have one of the best starts and slipped to ninth place after starting from sixth. 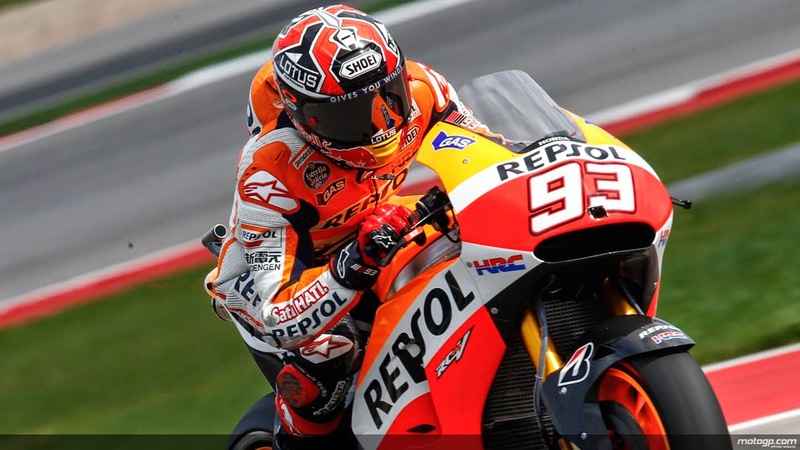 But in his typical manner, he overtook riders in front and arrived at fourth within a few laps behind Andrea Iannone. Rossi looked quite comfortable in taking third position from Iannone; however, he soon faced trouble with his front tyre when its right side started to lose grip rapidly. Rossi dropped to eighth eventually behind Andrea Ionnone, Bradley Smith, Pol Espargaro, Stefan Bradl and Andrea Dovizioso and held this position till the end of the race. Aleix Espargaro and Jorge Lorenzo rounded the top 10. Other than Rossi who was the more serious victim of the front tyre problem, Andrea Ionnone, Stefan Bradl, Colin Edwards and Pol Espargaro ran into similar trouble with the front tyre at different points in the race. The race was, however, the biggest disappointment for the factory Yamaha pair of Lorenzo and Rossi. Lorenzo will go to the next race with even more pressure, but with 16 races still remaining, he has his work cut out clearly. After the first-two rounds, Marc Marquez is leading the 2014 championship with 50 points while Pedrosa is second and Rossi is third.